This is the story of the lives of Aminata Diallo. She is a free girl who lives in the early 19Th century near Sego in Africa before being abducted by other Africans and sold into slavery. She spends many years in South Carolina as a slave, first on an indigo plantation and then as an assistant to a Jewish business man. When in New York she runs away from him and begins afresh as a free woman amongst other blacks and British Military. After the War she is transported to another new life in Nova Scotia along with hundreds of other British Loyalists. Life there is better than slavery, but it does not live up to the promises of the British. After decades of exile from Africa, the Sierra Leone Company offers to help re-settle the landless black Loyalists onto African soil. Aminata does try to return to the village of her birth but is challenged at every step, by distance (a three month walk inland), age and health and by those who would try and re-enslave her. Realizing that she can't turn the clocks back 60 years and regain her first life, she travels to England to lend her story and her voice to the cause to stop the slave trade. I remembered when I lived in the Caribbean and studied the Slave Trade in 4Th Form. The teacher made it very clear to the two white girls in the class that they were personally to blame for the atrocities that happened more than 100 years earlier. Mr. Hill never made me feel as though he was assigning blame. He presented a well balanced account of who was involved at the various times and how they benefitted. Aminata is not portrayed as a vengeance seeking woman, though she had every right to be, but rather as a woman who has a goal (re-united with her husband, find her daughter and return to the village of her birth)and must survive in order to achieve it. She decided very early that anger wasn't going to get her anywhere but hurt or dead. I'm glad that we learned much of Aminata's early life. She lived in a vibrant community with a rich history, with a loving family, an educated father and a religion that held the promise of a wealth of knowledge to come. I have heard arguments that the slavers were saving the blacks from their heathen existence. That has always bothered me that one group of people can dismiss the accomplishments and lifestyle of another just because it is different from their own. I liked this book. Not only is it the story of a strong girl/woman who accomplishes what she sets out to do, but a humanized, historical account of a dark era in North American history. 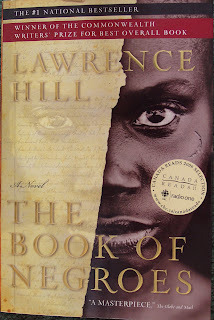 This book was selected for the 'One Book One Community' read for Waterloo Region (where I live). It should provide lots of opportunity for discussion. update: Sept 15 Community discussions of this book have began and the newspaper and local TV have good coverage. See the 'One Book One Community' link above for locations of readings with Mr. Hill. Winner of the 2008 Commonwealth Writers' Prize for Best Book.